I have really been enjoying Historical Fiction lately. 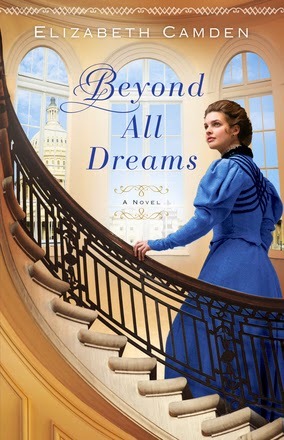 Most of the Historical Fiction that I have been reading is set in England, so when I was given the chance to check out a new book by Elizabeth Camden set in Washington D.C. in the late 1890s called Beyond All Dreams, I jumped at the chance. The book jumps right in to the story in the first chapter, introducing Anna O'Brien and Luke Callahan. We are also given just a bit of background to help set the stage. The story starts out a little bit slow, but then quickly gathers momentum pulling the reader into the story. I felt that the story really said a lot about being content and what happens when you push beyond normal boundaries and experiences. The outcome of doing so certainly is not always what you had hoped or expected, but as the title suggests, sometimes the outcome is beyond all dreams. I really enjoyed the balance of historical fact inter-mixed with the fictional tale. You could tell the author had done her research, from the opening of the new building for the Library of Congress to the Tourmaline mine in Maine. The history going on around the story helped to make the characters and events in their lives more real to me as a reader. The story is told in third person, yet there are plenty of insights offered by the narrator into what the characters are thinking. This really helped me as a reader get to know the characters and allowed a nice balance of learning about more than just one character's inner thoughts. I really enjoyed the book and found the experience of reading it satisfying. I would recommend the book to others that enjoy historical fiction or romance. I haven't read any of Elizabeth Camden's other books, but based on my enjoyment of this book, look forward to reading others. You can learn more about the book and author, as well as find other reviews on the blog tour landing page. Lots of good insights in your review! I found your blog as I was posting my own review on the Litfuse page and browsing others. If you're looking for another book to read by Elizabeth Camden, I really enjoyed "The Lady of Bolton Hill." I think "Beyond All Dreams" is my favorite though.